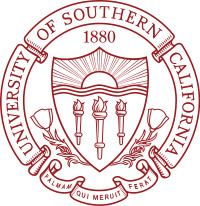 The University of Southern California (commonly referred to as USC,[a] SC, Southern California, and Southern Cal[b], although the university officially discourages the latter) is a private, nonsectarian, research university located in the University Park neighborhood in Los Angeles, California, USA. USC was founded in 1880, making it California's oldest private research university. The university enrolled 16,384 undergraduate and 17,024 graduate students and awarded 4,676 bachelor's and 5,380 advanced degrees in 2007. USC's four year, full-time undergraduate program is classified as "more selective, higher transfer-in" by the Carnegie Foundation and was ranked 26th among national universities by U.S. News & World Report, which classified it as one of the "most selective universities" for admitting 21% of the 35,809 who applied for freshman admission in 2008. According to the 2007 freshman profile, 18% of admissions were associated with legacy preferences. USC was also named "College of the Year 2000" by the editors of Time and The Princeton Review for the university's extensive community-service programs. USC students hail from all 50 states in the United States as well as over 115 countries. USC employed 3,127 full-time faculty, 1,363 part-time faculty, and about 8,200 staff members in 2007. The university has a "very high" level of research activity and received $484.6 million in sponsored research in 2007. USC is home to two National Science Foundation–funded Engineering Research Centers: the Integrated Media Systems Center and the Center for Biomimetic Microelectronic Systems. NOTE: CosmoLearning is not affiliated or endorsed by University of Southern California. This page is only intended to credit this content provider for their educational content being included on the CosmoLearning site.